The world premiere of Aleksandra Maciejczuk short documentary "Connected" will take place at IDFA. Take a minute and read our review. "Connected" by Aleksandra Maciejczyk is a short-length portrait of an extraordinary couple of 50-year-olds: the blind Krzysztof, who returns to the ski run after ten years and his guide, Wiola. The beginning of the film promises a classic documentary film, we watch the protagonists prepare for the skiing. At some point, Krzysztof and Wiola install Bluetooth sets on their helmets, so that they can communicate while they are on the ski slope. Gradually, since this very moment, the central position of the protagonist is replaced with the relationship and we notice that the couple can be fulfilled only thanks to her. A human being is fulfilled in the relationship with another human being - this is the thought which comes to mind after the screening of "Connected." "Connected" has a very interesting narrative structure. 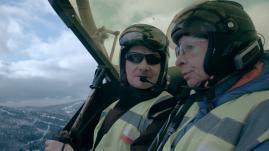 Almost all film long, Krzysztof and Wiola are climbing to the top of the mountain. The higher they are, the more we learn about their lives, they have normal, everyday conversations, about the weather, about how they feel, but also some more intimate conversations, from which we can find out more about their past and the emotions which accompanied them at the specific stages of their lives. The weather conditions change minute by minute, the fog over the ski slope thickens, and the couple falls for the first time. Everything changes, the communication in the high mountains starts to fail, and the form of the film also changes - the clear, classic shots from the beginning of the film are replaced with the series of blurred and violent shots, resembling the point of view of our protagonists. Through the media of images and various cinematic techniques, we are invited to the world of Krzysztof and Wiola, the world in which the protagonists can only survive thanks to the relationship which forms in front of our very eyes. Thanks to this, the emotions and the relationship between the couple are transferred to the viewer, we have an extraordinary impression of participating in the life which we watch on the screen. In this respect, the documentary film by Aleksandra Maciejczyk transcends a reliable reportage about strong people, portrayed in a situation when they overcome their weaknesses, and it becomes a short essay about the essence of a relationship, about love.